HABIT: Dark-green, large-leafed foliage plant. Leaves sprout from the ground. Spreads by rhizomes. Native to Japan. CULTURE: Easy to grow in any well-drained soil. Shade and plenty of water. Called Cast Iron Plant because of its toughness. USES: Tall ground cover, coarse texture, low light area. Container plant. 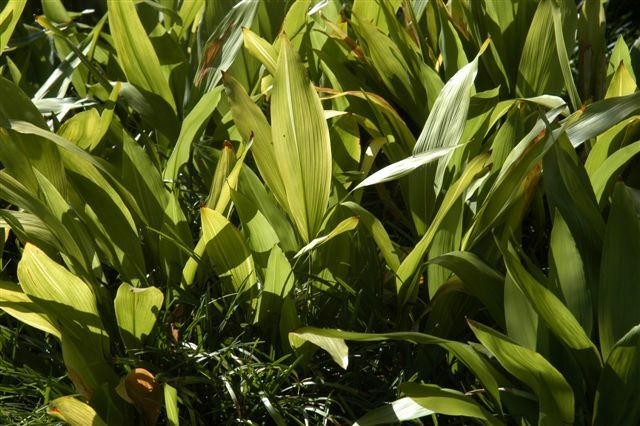 PROBLEMS: Edges of foliage get ragged, especially in windy areas. Grasshoppers occasionally. NOTES: Not easily apparent, the cast-iron plant bears its flowers and fruits just beneath the soil line.